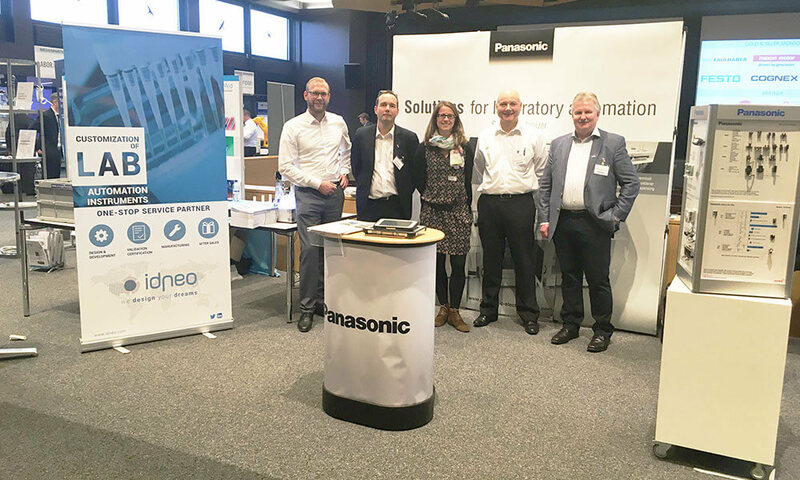 The Swiss Symposium on Lab Automation 2019 took please Thursday, March 14th, 2019 at the HSR Hochschule für Technik Rapperswil. The focus of this year SSLA was Digital Transformation in the Laboratory. This Symposium brings together most important stakeholders in laboratory automation mainly from the Swiss health valley but also from other countries, mainly Germany. Idneo Medtech has presented in Panasonic own booth giving visitors the possibility to meet booth companies and get to know future collaboration solutions that will meet specific market challenges. During the all-day Symposium different companies presented their vision on digital transformation on the lab. The presentations emphasized the idea that laboratories require deep understanding of the specific needs, purpose and risks associated with each of them and digital transformation in Labs, which enables high degree of reproducibility and reduce errors, has not been keeping up. This is mainly because it requires “Management change” which covers all measures used to change the strategies, structures, processes and behavior organization. Integrating systems to better support analytical and workflow, changing the operating model, automating and integrating routine testing tasks and adopting new technologies is the way forward to apply Digital Transformation and Automation to the labs. Idneo as an Engineering company and our partner Panasonic, as medical sensor developer, will join efforts to by bring to the market new technology solutions.